Dialysis technologies have continued to advance over recent decades; however, these advancements have not always been met with improved patient outcomes. In part, the high morbidity and mortality associated with dialysis have been attributed to a group of uremic toxins, which are described as “difficult to remove.” With a new generation of hemodialysis membranes now making meaningful clearance of these molecules possible, it is an apt time to review the clinical relevance of these middle molecules. Our review describes the developments in membrane technology that enable the removal of large middle molecules (molecular mass >15 kD) that is limited with high-flux dialysis membranes. Of the known 58 middle molecules, a literature search identified 27 that have molecular mass >15 kD. This group contains cytokines, adipokines, hormones, and other proteins. These molecules are implicated in chronic inflammation, atherosclerosis, structural heart disease, and secondary immunodeficiency in the literature. Single-center safety and efficacy studies have identified that use of these membranes in maintenance dialysis populations is associated with limited loss of albumin and increased clearance of large middle molecules. Larger, robustly conducted, multicenter studies are now evaluating these findings. After completion of these safety and efficacy studies, the perceived clinical benefits of providing clearance of large middle molecules must be assessed in rigorously conducted, randomized clinical studies. ESKD is accompanied by a constellation of symptoms, functional system impairments, and accelerated disease processes related at least in part to the retention of a large number of solutes that are normally excreted or metabolized by the kidney. These solutes have become known as uremic toxins, and they are defined as molecules that accumulate in kidney impairment and have an adverse biologic effect (1). They can be broadly classified into three groups: small water-soluble molecule, middle molecule, and protein-bound solutes. Of these three groups, the small water-soluble molecules are most efficiently removed by established dialysis technologies. However, the clearance of many middle molecules and protein-bound solutes is limited using current dialysis strategies (2). Middle molecules have a broad range of molecular mass from 500 to 60,000 D (1). Historically, the size of the middle molecules has been a barrier to their removal with dialysis membranes. The current high-flux membranes were principally designed to remove β2-microglobulin, an 11.8-kD middle molecule. The development of dialysis technologies and the improved ability to regulate fluid loss across the dialysis membrane have enabled an increase in the porosity of the membranes. Suspicion that the inadequate removal of middle molecules has played a large part in the morbidity and mortality of patients on dialysis has driven developments in dialysis technology and clinical dialysis practice aimed at providing increased removal of these molecules. However, the clearance of middle molecules with molecular mass >15 kD is low using standard high-flux membranes (3). Therapy using convection in addition to diffusion, hemodiafiltration (HDF), has now become an established method for increasing the clearance of middle molecules (4). To date, regulatory constraints and a lack of conclusive evidence showing the benefit of HDF have resulted in sporadic uptake of the technology. Recent advances in membrane technology have now enabled the development of a new generation of dialysis membranes, the medium-cutoff (MCO) membranes, which allow the removal of middle molecules up to approximately 50 kD, surpassing even the clearance range provided by HDF (5–7). Unlike the earlier high-cutoff (HCO) membranes, which were used in myeloma kidney, the MCO membranes have significantly less albumin loss (7–9). The purpose of this review is threefold. First, it will describe the development of dialysis membranes to allow the removal of large middle molecules without albumin loss. Second, it will identify the large middle molecules that can now be removed by the MCO membranes, namely those with molecular mass above 15 kD, and assess their clinical relevance to patients on dialysis. Third, it will evaluate the clinical experience to date with these membranes and determine what should occur before they are accepted as a new therapeutic option for ESKD. The hollow fiber hemodialysis membrane is made by a process of spinning the membrane polymer through a solvent. This process of spinning results in a semipermeable membrane with a very thin inner separation layer that acts as the functional surface of the membrane and a wider supportive matrix. The pores within these membranes are nonuniform and have a “bell-shaped” distribution of size from small to large (Figure 1). To prevent significant albumin loss, in high-flux dialyzers, the largest of these pores is still smaller than albumin. Medium cut-off membranes provide clearance of large middle molecules without albumin loss. Schematic of pore size distribution in dialysis membranes. As membranes have been developed to allow the removal of large middle molecules (MMs) without albumin loss, the distribution of the pore sizes has had to be “tightened.” The pink bar represents the distribution of large MMs before albumin is lost. The solid line indicates low flux, the dotted line indicates high flux, the dot-dash line indicates high cutoff (HCO), and the large dashed line indicates medium cutoff (MCO). 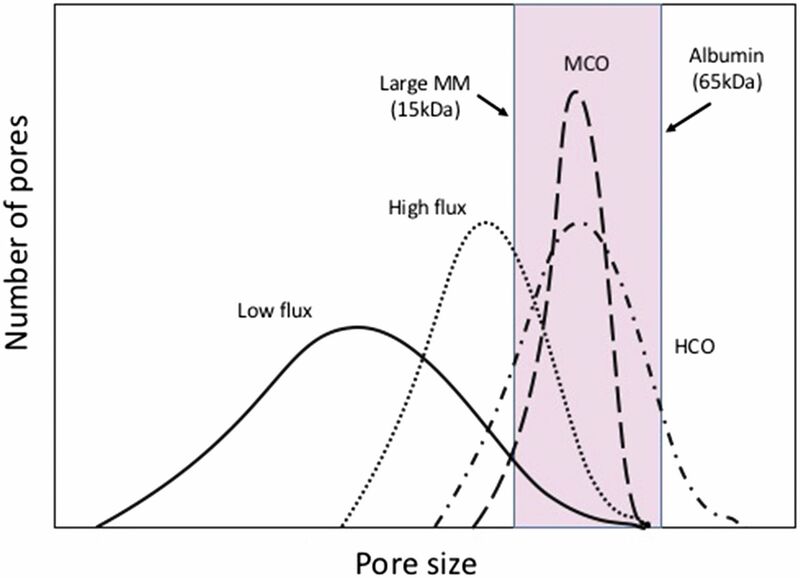 To increase the size of molecules removed by a membrane, the sizes of the pores needs to be increased by moving the distribution of the pores to the right, which occurred with the HCO membranes. Although the HCO membranes were able to remove larger molecules, such as the free light chains-κ and -λ in myeloma kidney, this creation of larger pores resulted in the loss of albumin due to the nonuniformity of the pores (7). To enable the clearance of larger middle molecules with molecular mass between 15 and 60 kD without the loss of albumin, the distribution of the pores within the dialysis membranes had to fundamentally change to a tighter distribution (Figure 1). The MCO dialyzers use this new distribution of pores (10). In clinical practice, these membranes should provide effective clearance of large middle molecules without excessive albumin loss. The EuTox database (http://www.uremic-toxins.org/DataBase.html), associated publications (8), and a Medline search were used as the starting points to generate a list of uremic toxins that can be classified as middle molecules, which were then applied to a literature search algorithm. The accumulated literature was then reviewed to determine the clinical relevance of the middle molecules as uremic toxins in relationship with the following broad groups: cardiovascular disease, chronic inflammation, secondary immunodeficiency, protein-energy wasting, and cachexia. The review was confined to those middle molecules with molecular mass >15 kD, above which clearance by high-flux dialysis membranes is reduced and clearance is increased by MCO membranes (5) (Table 1). In addition to the middle molecules previously described, we identified two novel uremic toxins with molecular mass >15 kD: Pentraxin-3 (PTX3) and Visfatin. Protein-bound solutes are clinically relevant but were not assessed, because they cannot be removed by the MCO membranes. The literature review identified 27 middle molecules with molecular mass >15 kD, the largest of which was 52 kD (Table 2). Although advanced oxidative protein products are “large” middle molecules (8), with molecular mass ranging from 60 to 600 kD, they would not be removed by the new MCO membranes, and therefore, they were not reviewed. For the purpose of this review, some groups of the large middle molecules identified have been summarized into a single entity for convenience, such as advanced glycosylation end products (AGEs). The serum levels of the identified middle molecules range from <1.5- to >200-fold higher in individuals receiving dialysis or with advanced CKD compared with those with normal kidney function. The majority of the molecules can be measured using commercially available assays, with most using an ELISA-based assay (Table 2). The molecules identified have diverse biologic roles; for the purposes of this review, the molecules were grouped into four broad functional groups (cytokines [n=5], adipokines [n=4], immune-related proteins [n=8], and growth factors and hormones [n=4]) and other molecules (n=6). In Table 2, the molecular mass, usual biologic role, and possible adverse effects in uremia are described for each molecule. To determine the clinical relevance of providing increased clearance of these large middle molecules, their involvement in the following processes was assessed: cardiovascular disease, secondary immunodeficiency, protein-energy wasting, cachexia, and chronic inflammation. Patients with CKD and especially those reliant on maintenance dialysis are subject to a substantially elevated risk of cardiovascular disease and cardiovascular mortality compared with the general population. Many of the large middle molecules are involved in progressive atherosclerosis (Figure 2), and serum concentrations are correlated with both rates of cardiovascular disease and overall survival (Table 3). Large middle molecules are pathologically involved in atherosclerosis. Large middle molecules and atherosclerosis. The cytokines IL-6, IL-18, and TNF-α result in increased expression of inflammatory genes, which are proatheroma formation. Advanced glycosylation end products (AGEs), TNF-α, IL-6, and adiponectin all result in increased expression of adhesion molecules on the vascular endothelium. Elevated levels of IL-1b result in increased expression of IL-1 receptors, which in turn, results in monocyte recruitment, macrophage activation, and the proliferation of smooth muscle cells (SMCs) and endothelium. In addition, prolactin stimulates SMC proliferation. Elevated levels of the proinflammatory cytokines IL-18, TNF-α, IL-6, and IL-1b are all involved with cardiovascular disease. IL-6 is an upstream inflammatory cytokine that plays a central role in propagating the downstream inflammatory response responsible for the development of atherosclerosis. This causative role of IL-6 has been suggested by the recognition that individuals with a variant in the IL-6 receptor that impairs classic IL-6 signaling have a decreased risk for coronary heart disease (11). Similarly, IL-1b has been described to be pathologically involved in the progression of atherosclerosis (12). Serum concentrations of IL-18 are associated with plaque burden and instability, and in large populations, they have been shown to been independently predictive of cardiovascular outcomes (13). Animal models have identified that infusion of IL-18 leads to plaque formation (14). TNF-α alters endothelial and vascular smooth muscle cell function as well as increases expression of adhesion molecules on vascular endothelium, leading to vascular dysfunction and atherosclerosis. Other inflammation-related middle molecules have also been associated with cardiovascular disease (Table 2). PTX3 has been linked to unstable plaque in coronary and carotid arteries, raising suspicion that PTX3 may play a causative role in this process (15). There is evidence that atherogenic lipids can induce PTX3 in vascular smooth muscle cells (16) and that PTX3 may have prothrombotic effects by amplifying tissue factor expression in endothelial cells and monocytes in response to inflammatory stimuli as well as impairing nitric oxide production (17,18). Other middle molecules that have been linked with cardiovascular disease include β-trace protein (BTP) in patients on incident dialysis (19). Serum BTP correlated with severity of coronary disease (20), and BTP mRNA is most strongly expressed in early atherosclerotic plaque lesions (21). This again does not clarify if BTP is a protective or damaging factor in this process. However, knockout of the gene in mice susceptible to diet-induced diabetes and atherosclerosis led to accelerated glucose intolerance, insulin resistance, nephropathy, and aortic thickening (22). Prolactin levels have also been associated with increased risk of cardiovascular and all-cause mortality in the general population (23) and cardiovascular events and all-cause mortality in CKD/dialysis populations (24). The mechanism is not clear, but prolactin is now thought to have diverse effects on lipids and blood vessel function, suggesting a plausible pathway. AGE levels correlate with cardiovascular disease and mortality in patients on dialysis (25). Tissue accumulation of AGEs can contribute to cardiovascular disease by crosslinking with other molecules, causing structural changes and inducing inflammation in the heart and blood vessels (26). Direct effect of AGEs via interactions with the receptor for AGE seems to cause endothelial dysfunction by inhibiting nitric oxide synthase and increasing expression of adhesion molecules. The adipokine visfatin is also strongly upregulated in atherosclerotic plaque, and serum levels are higher in those with unstable rather than stable vascular disease. Visfatin may contribute to inflamed plaque by inducing inflammatory macrophage differentiation (27). 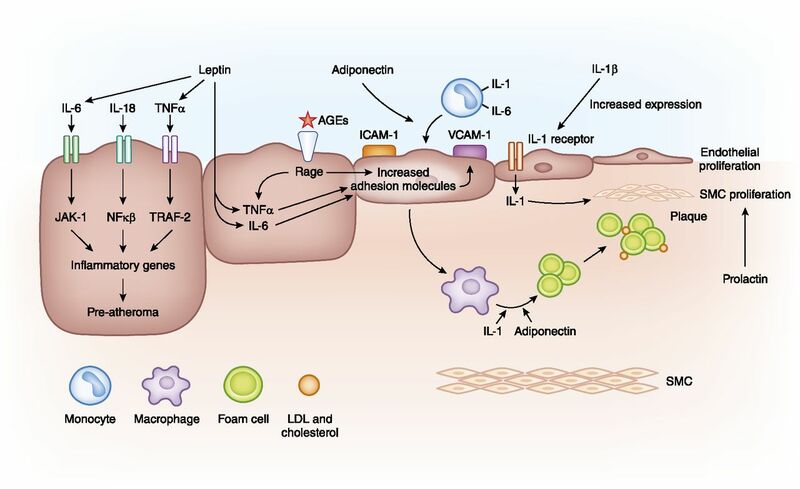 Additionally, the adipokines adiponectin and leptin have been implemented in progressive atherosclerosis by contributing to the recruitment of macrophages and the formation of foam cells. Several growth factors have been linked to cardiac hypertrophy, with experimental animal studies implicating fibroblast growth factor 2 (FGF-2) and FGF-23 as having a direct causal role in this process. Gene knockout models suggest that FGF-2 is necessary for the development of cardiac hypertrophy in response to hypertension (28), and administration of FGF-23 caused left ventricular hypertrophy, which was attenuated with an FGF blocker in another series of experiments (29). There is also robust observational evidence in humans supporting a link between FGF-23 and left ventricular hypertrophy (29,30). ESKD is associated with significant immune dysfunction. Despite high cytokine levels, immune cell function is impaired, and patients on dialysis experience high rates of infection-related morbidity and mortality (31). Several large middle molecules have been shown to directly cause impairment of immune cell function in experimental models (Table 4). Ig free light chains were shown to reduce glucose uptake by polymorphonuclear leukocytes in vitro and reduce chemotaxis (32). Additionally, serum free light chain levels were an independent risk factor for death by infectious cause in a CKD population (33). RBP4 also inhibits the chemotactic movement of polymorphonuclear leukocytes in a concentration-dependent fashion, and it inhibits oxidative metabolism and apoptosis (34). FGF-23 has also been shown to exert inhibitory effects on leukocytes in a mouse CKD model in a dose-dependent fashion, which was reversible with a neutralizing antibody toward FGF-23 (35). Additionally, α1-acid glycoprotein inhibits the migration of neutrophils to infectious foci (36) and is associated with the susceptibility to infections in individuals with diabetes (36). There is evidence linking IL-6, TNF-α, and IL-1β to anorexia and protein-energy wasting in cancer, AIDS, and geriatric cachexia, and this is supported by interventional animal models. Evidence specific to patients with CKD and patients on dialysis is also growing stronger. Elevated levels of the adipokine leptin can contribute to protein-energy wasting by inhibiting food intake and increasing energy expenditure. Of the cytokines, IL-6 has a clear inverse relationship with albumin levels in patients on dialysis and has been found to negatively correlate with muscle mass (37). TNF-α levels were higher in patients on dialysis with poor appetite or evidence of anorexia, nausea, or vomiting compared with those without. Higher TNF-α levels are also associated with lower prealbumin and body mass index (38). Higher IL-1β levels were associated with lower physical activity scores and faster declines in a bioimpedence-derived measure of body cell mass when patients on hemodialysis were followed longitudinally (39). Chronic inflammation in patients on dialysis is multifactorial due, in part, to the retention of inflammatory cytokines, proteins, and other factors that induce inflammation. IL-6 release from both leukocytes and peripheral tissues is upregulated in uremia (40,41), and both IL-1β and its circulating receptor antagonist IL-1Ra are increased (42). Although IL-1Ra is an antagonist, a large excess of IL-1Ra is required to block effects of IL-1β, and it is, therefore, likely that elevated IL-1β and IL-1Ra as seen in patients on dialysis act predominantly as an agonist to the IL-1 receptor (43). Both TNF-α and the soluble TNF receptors 1 and 2 (38) are increased in CKD. The increased soluble TNF receptors levels increase the circulating t1/2 of TNF-α, contributing to the chronic inflammation of ESKD. In addition to the retention of these proinflammatory middle molecules, other molecules not directly involved in the inflammatory cascades can still stimulate inflammation. For example, AGE levels correlated independently with CRP (44), and there is suspicion that tissue accumulation of AGEs induces chronic inflammation. Large middle molecules would seem to be a clinically relevant group of uremic toxins to be removed from patients with ESKD. However, a number of steps now need to occur to determine if patient outcomes are genuinely improved with this new dialysis membrane. Safety is paramount. With an increasingly porous membrane, such as those in the MCO dialyzers, there are two principle safety concerns: albumin loss and back filtration of endotoxins. Schepers et al. (45) assessed the back filtration of endotoxins in vitro and identified no increased back filtration with MCO dialyzers compared with high-flux membranes. Hemodialysis with the MCO membranes is associated with albumin loss of approximately 3 g per session (6). In an initial assessment of MCO dialyzers, Belmouaz et al. (46) monitored ten patients converted from online HDF to MCO dialysis and did not identify a significant change in serum albumin concentrations, suggesting that this level of albumin loss is tolerable. The REMOVAL-HD Study in Australia and New Zealand is a single-arm, multicenter study designed to specifically address the safety of MCO dialysis (ANZCTRN 12616000804482). Powered to detect a 5% change in predialysis serum albumin concentrations over 6 months, the study is now fully recruited and will report in 2018. In addition to safety, the efficacy of MCO dialysis for the removal of large middle molecules should also be assessed. Kirsch et al. (9) showed that MCO dialysis provides increased clearance rates of Complement factor D (24 kD), α1-microglobulin (33 kD), and YKL-40 (40 kD) in comparison with high-flux dialysis sessions. The ability of these increased clearance rates to provide sustained reductions in predialysis concentrations of large middle molecules is being assessed in the REMOVAL-HD Study, which is measuring λ-free light chain, one of the largest middle molecules (45 kD). After the reporting of these assessments of safety and efficacy of MCO dialysis, robust clinical trials will then be required to determine patient benefit. This review of the literature suggests that increased removal of large middle molecules is most likely to provide patient benefit by the reduction in cardiovascular disease. Evidence of potential benefit is growing rapidly. In small studies to date, dialysis with MCO membranes has been associated with a reduction in the activation of the renin-angiotensin system (47), reduced serum concentrations and expression of proinflammatory cytokines (TNF-α and IL-6) (48), and reduced induction of vascular calcification (49). It would, therefore, be logical that future clinical trials could potentially have major cardiovascular events as a primary outcome when comparing MCO dialysis with current standards of care; this would fit with the recommendations of the SONG initiative, which identified MACE as one of the four principal outcomes for dialysis studies (50). Individuals with ESKD requiring dialysis support continue to have high morbidity and mortality. When the causes of this disease burden are analyzed, chronic inflammation, protein-energy wasting, cardiovascular disease, and secondary immunodeficiency are key culprits. In this review, we have assessed whether the large middle molecules that are inadequately removed by current dialysis strategies could be contributing to this disease burden. Of the 27 large middle molecules identified, many have biologic pathways through which they can contribute to chronic inflammation, protein-energy wasting, cardiovascular disease, and secondary immunodeficiency. Robust clinical trials are now required to determine if increasing their removal by dialysis can translate to improved clinical outcomes. C.A.H. has received research funding from Baxter and participated on advisory boards and speaker bureaus for Baxter.